Meet my favorite pumpkin soup recipe. 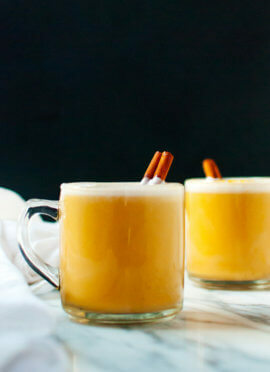 It’s super creamy (thanks mostly to the pumpkin, with a little help from coconut milk or cream) yet plenty healthy, too. It’s gently spiced, but I made sure that the pumpkin flavor shines above the rest. 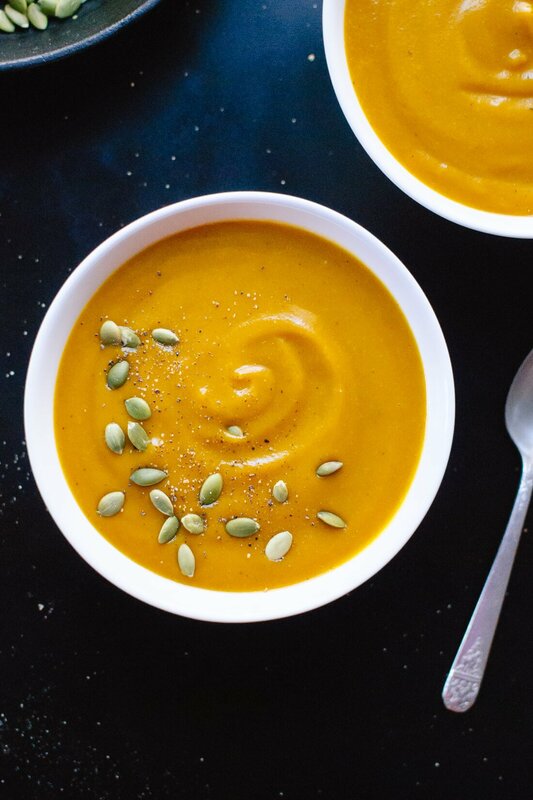 This dairy-free pumpkin soup would be a welcome addition to your holiday table. It would be equally at home with a soup or sandwich from fall through winter. It’s easy to make and the leftovers taste even better the next day. So, you could certainly make the soup a day in advance. Don’t be intimidated by the ingredient list—this soup only requires basic pantry ingredients! This soup was inspired by my recent trip to Portland. While I was there, I went to lunch with my baby brother and our friend Bill. I’ve written about Bill over the years—in summary, Bill beat leukemia with the help of my stem cells. He’s the toughest guy I know. 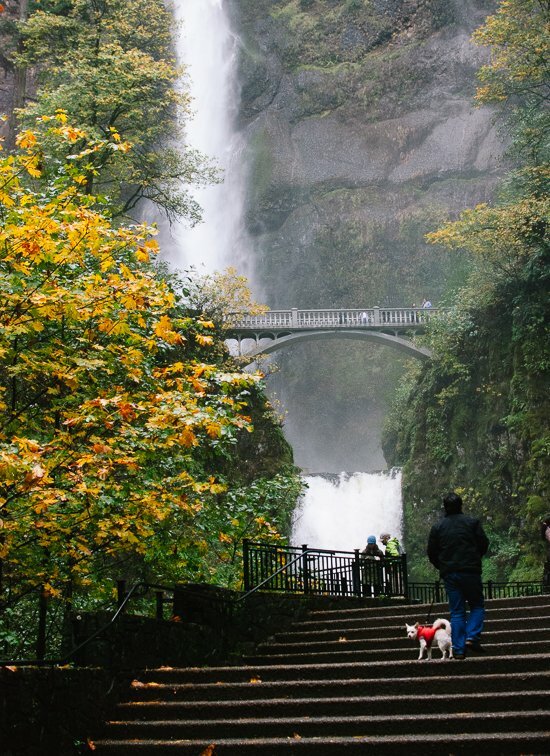 We shared lunch and an afternoon at Multnomah Falls. 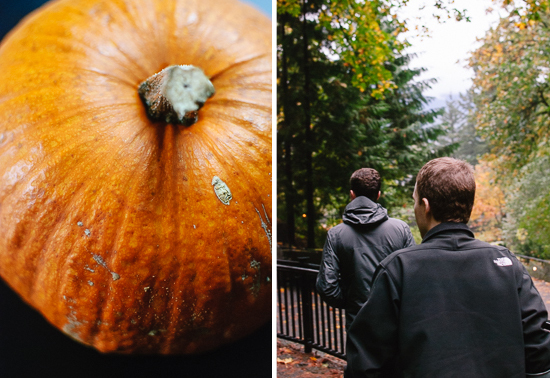 It was a damp, gray fall day in the Pacific Northwest and it was perfect. Bill picked The Picnic House for lunch. You really have to go next time you’re in Portland. “Unique” doesn’t begin to describe it—the restaurant feels like an old school theater inside, with different scenes set up in every corner and amazing food everywhere the eye can see. I was tempted to order every item on the menu, but after much deliberation, I finally settled on a small soup, salad and sandwich. 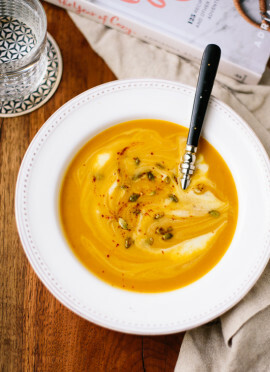 I might just have to recreate all three of them for the blog (so good), but homemade pumpkin soup seemed most timely. I can’t say that my version is exactly the same, but it is equally satisfying and fresh. It’s utterly delicious in its own right. This pumpkin soup recipe includes instructions on how to roast fresh pumpkin, for maximum pumpkin flavor. Canned pumpkin purée also works well, if you’re in a time crunch. See the recipe notes for details! Please let me know how this recipe turns out for you in the comments. I’m always so eager for your feedback. If you’re craving more cozy fall soups, don’t miss my butternut soup, lentil soup or minestrone. Looking for more Thanksgiving recipes? This is for you. Happy holidays! 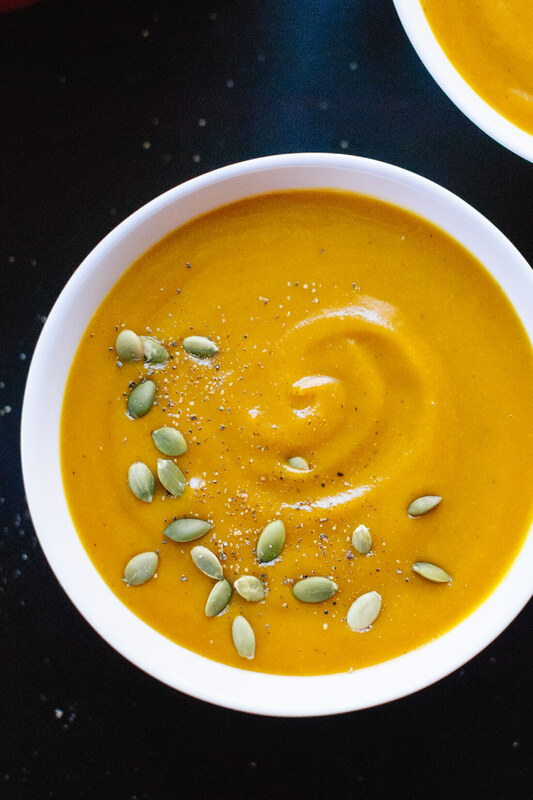 This pumpkin soup recipe is creamy AND healthy! 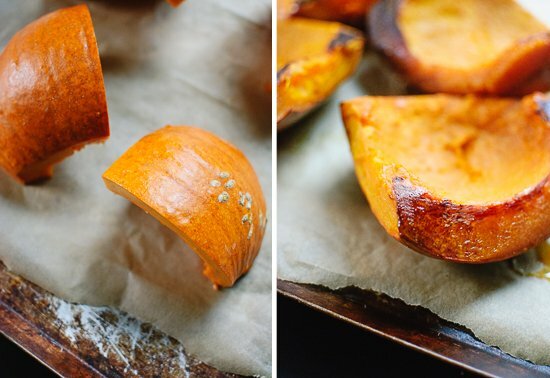 It calls for roasted pumpkin for maximum flavor. 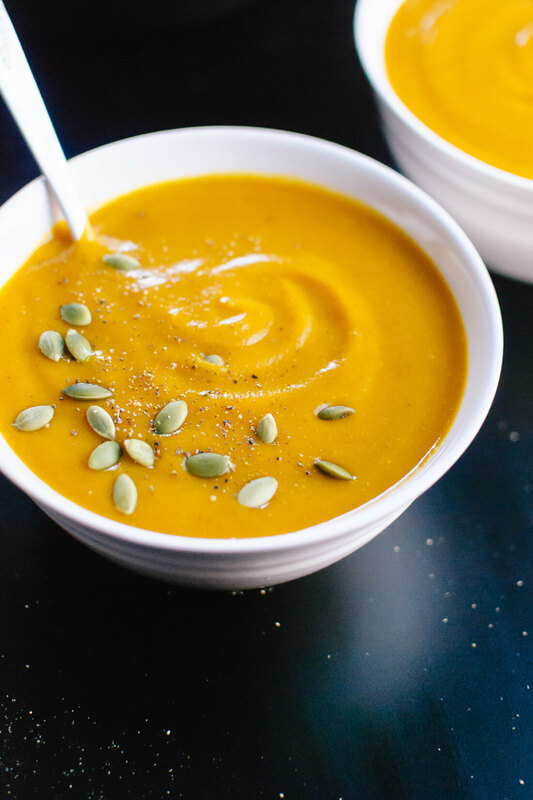 This roasted pumpkin soup recipe would look lovely on your holiday dinner table, and leftovers would go great with sandwiches or salads the next day. Recipe yields 4 bowls or 6 cups of soup. Heat the remaining 3 tablespoons olive oil in a large Dutch oven or heavy-bottomed pot over medium heat. Once the oil is shimmering, add onion, garlic and salt to the skillet. Stir to combine. Cook, stirring occasionally, until onion is translucent, about 8 to 10 minutes. In the meantime, peel the pumpkin skin off the pumpkins and discard the skin. Once the pumpkin mixture is done cooking, stir in the coconut milk and maple syrup. Remove the soup from heat and let it cool slightly. You can use an immersion blender to blend this soup in the pot. I prefer to use my stand blender, which yields the creamiest results—working in batches, transfer the contents of the pan to a blender (do not fill your blender past the maximum fill line!). Securely fasten the blender’s lid and use a kitchen towel to protect your hand from steam escaping from the top of the blender as you purée the mixture until smooth. 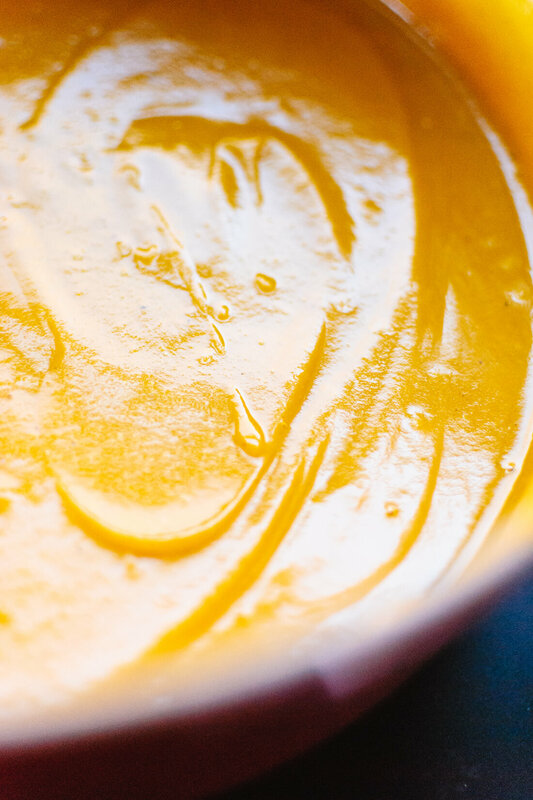 Transfer the puréed soup to a serving bowl and repeat with the remaining batches. Ladle the soup into individual bowls. Sprinkle pepitas over the soup and serve. Let leftover soup cool completely before transferring it to a proper storage container and refrigerating it for up to 4 days (leftovers taste even better the next day!). Or, freeze this soup for up to 3 months. Soup inspired by the pumpkin soup at The Picnic House in Portland and roughly adapted from my curried butternut soup. If you want to use canned pumpkin: Instead of roasting the pumpkin, you can substitute two to three cans of pumpkin purée. Just skip steps 1 and 2, and add two cans of pumpkin purée in step 4. You’ll still want to blend the soup for the best texture; add more pumpkin purée at that point if you’d like thicker soup. 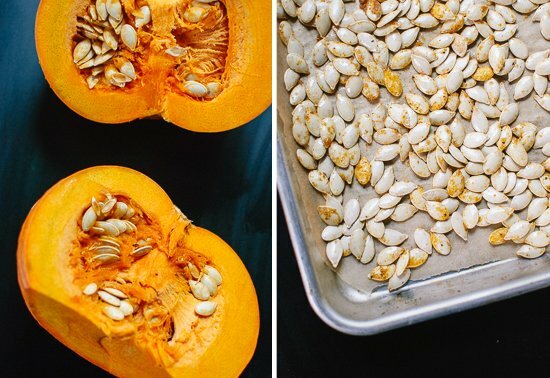 How to roast pumpkin seeds: Pick off all the flesh bits from the seeds and discard them. I like to do this in a colander under running water. Pat the seeds dry with a tea towel or paper towels. Toss the seeds with a little olive oil, a sprinkle of salt and any other seasonings that sound good (I tossed my pumpkin seeds with 1 teaspoon brown sugar and ½ teaspoon curry powder). Toss to coat. Line a small, rimmed baking sheet with parchment paper and arrange the pumpkin seeds in a single layer. Roast for 13 to 16 minutes, until the seeds are fragrant and toasty. Feel free to adjust to your liking! Thanks for the review, Amanda. I just made this recipe but I didn’t have veggie broth, so I used water and I didn’t have coconut milk, so I used hemp milk. It turned out really good! I’ve got a cold and it’s raining, so I didn’t want to go to the store. This was perfect for soothing my sore throat! Hemp milk, interesting! Thanks for your review, Sally. Of all the alternative milks, I believe hemp is the best – always creamy, and super nutritious! Thanks for the great recipe! 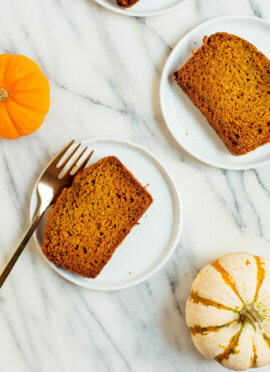 Made this with 2 cans of canned pumpkin–easy and yummy. My husband enjoyed it too, but I have to figure out which spice didn’t appeal to my 2 and 4 year olds … maybe the cloves. I’m glad you were able to enjoy it! Kids are picky! Lovely recipe. After simmering, did a taste test and decided it was sweet enough, so I left out the maple syrup and used light evaporated milk instead of coconut milk, and added more cayenne, as I like it spicy. Thanks! Thank you for sharing, Dee! Made the soup today.. i skipped the vegetable broth as I didn’t have any but it turned out really yummy! Thanks for the easy and lovely recipe. Thanks for letting me know you still liked it! Most pumpkins soup isn’t full bodied or sweet enough for me. I put in coconut cream and used honey instead of the maple syrup and it was perfect. So yummy. 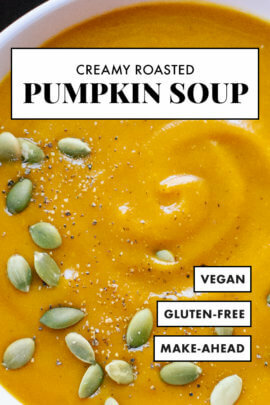 My husband who doesn’t like pumpkin soup tried it and was very impressed. This is a keeper for me thanks! !